By programming the equilibrium moisture content of the air, the seed will be dried to the desired moisture content automatically. 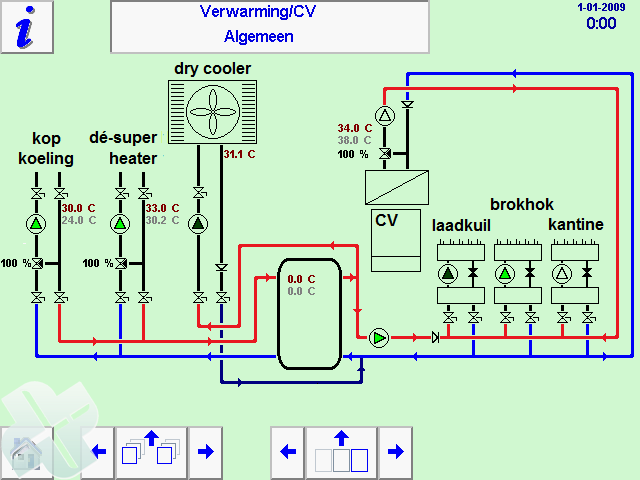 For each type of drying installation, Agratechniek has developed unique ABC software. 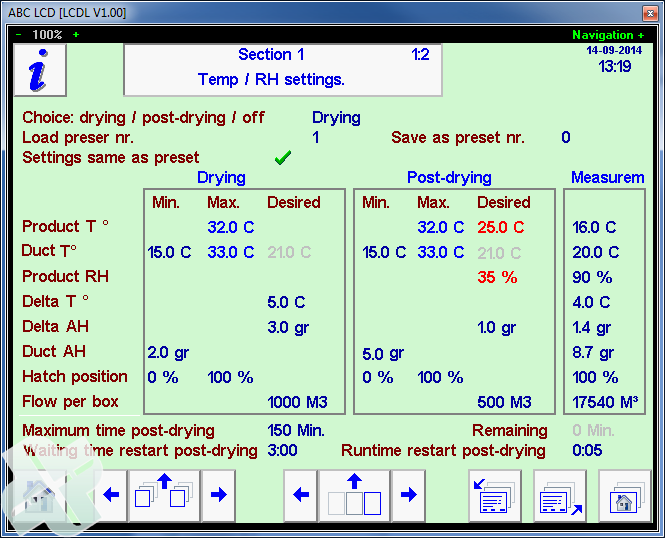 With this software, the equipment is controlled and the desired settings are managed to achieve the desired drying result. The regulation is specifically made for each installation. On the left an example of a drying installation with 11 sections `stacked box drying’ with central heating. Per section information is visible about the statuses and the measured values. By clicking on a section on the main page, the control for this section opens. You will see information on the measured values. The activity and status of the equipment is also visible; % control, color and possible movement. The desired settings page is immediately opened by pressing on different areas. All types of ABC software are very visual and informative. This makes the configurations understandable and easy to operate. 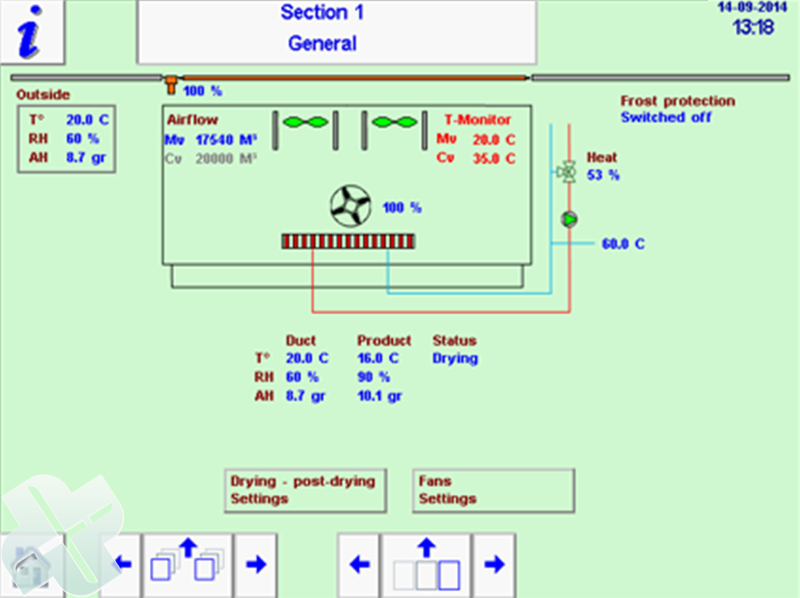 By clicking on ‘Drying – post-drying settings’ this page is opened immediately. This page also clearly shows the setting values and measured values. 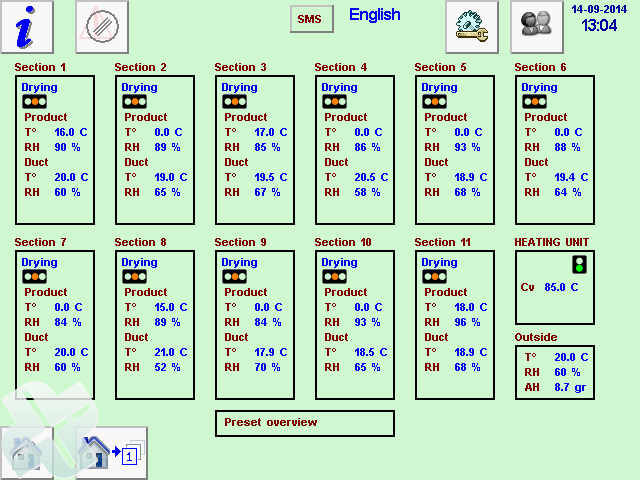 Very useful is the possibility of using `preset numbers’; 33 menus with specific drying configurations can be stored and simply be called up again. 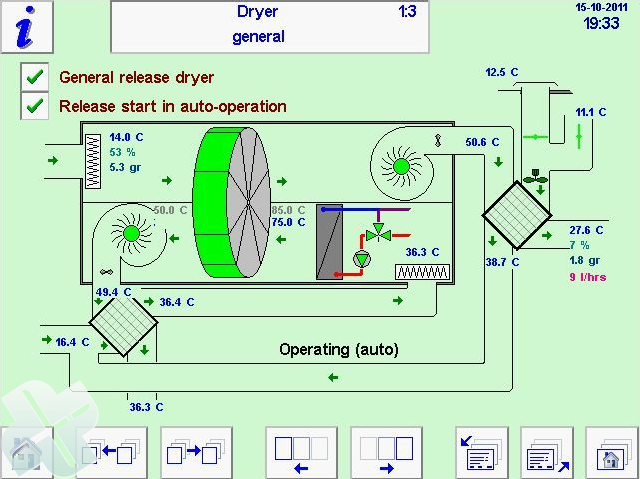 These visualization and possibilities are applied in all ABC programs for controlling different types of drying installations. 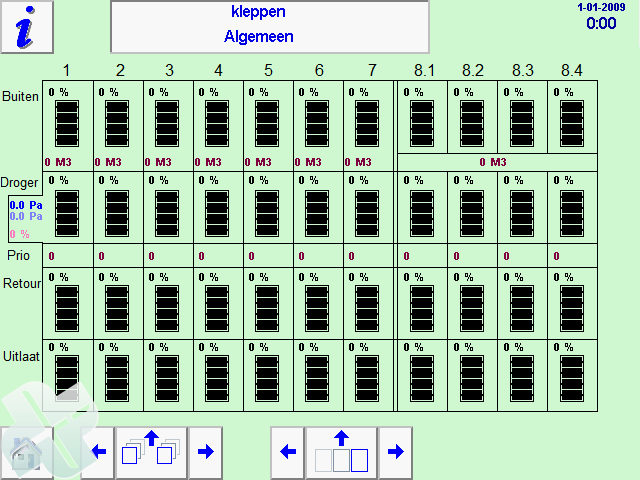 On the right, an example of ABC software for an installation whereat every box can be dried individually is shown. The installation exists of five sections for every three boxes. An icon for a box, mentioning air, absolute humidity and temperature from the product, is shown. For optimal drying, the sucked in fresh air will be mixed with dried air. Per section, one air valve, to bring in the right amount of dried air, is installed. Black means closed, green means open. Per box an indication of the drying status; orange (drying), blue (post-drying) and white (finished). By pressing the chosen icon, detailed information of the specific box will be opened. Schematic drawing of the place for a box, with installed equipment. Measuring- and controlling values of the ingoing air and the air from the product. 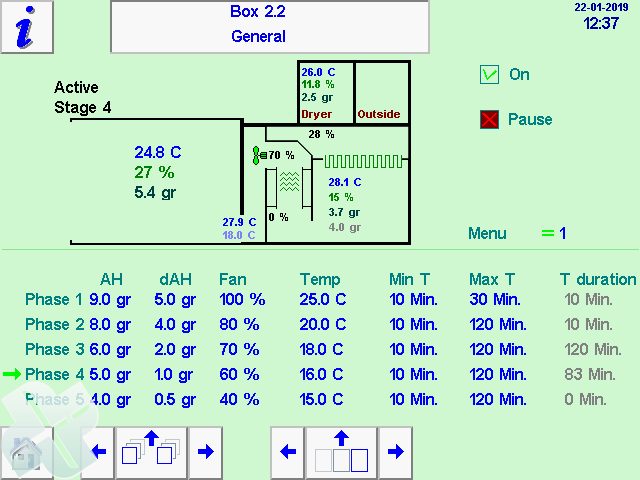 Settings per individual box; per phase of the desired humidity of the air, temperature, minimum and maximum drying time. To simplify the use of the installation, the ABC processor has got a function at which pre-sets (menus) can be set in advance. 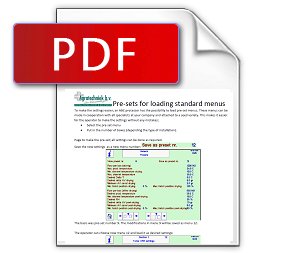 These menus are tailor-made per installation, each using specific software. Every composed menu will be saved under a unique number. Every place for a box can now easily called and activate the desired menu (which belongs to that seeds variety). Thus, the desired values can be set per seed type. On the left is an example of an arrangement where for each individual box the seed can be dried to the desired moisture content. This schematic drawing shows the cross-section of the installation. This concerns a drying section where boxes are placed in an open rack (A). Here the data is also visual and informative; for each item the action and status is clearly visible. Complete with various control and measurement values. A similar installation can be found on the right. Another section, but this time a closed drying installation. The air is sucked in per section and distributed to the boxes. All boxes have the same incoming temperature. The air volume and the desired moisture content is set per box. A variant of this arrangement is shown below. 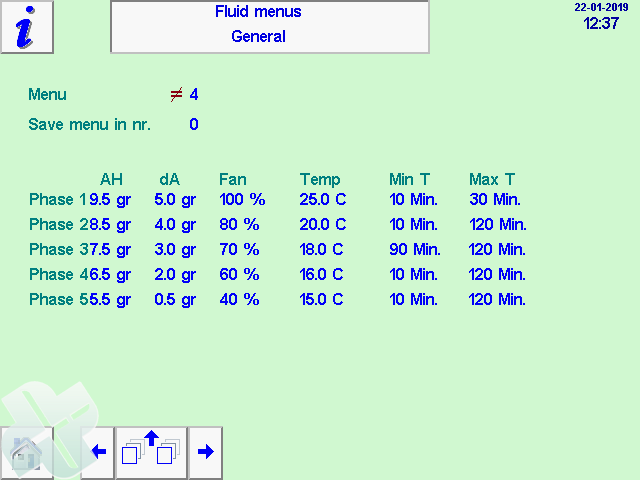 Here, the temperature is also being set for each box. And it is determined at box level whether the air can be moved outside or is being reused in the process. These were 4 examples of ABC applications to control and configure different kind of installations. There are many more variants. 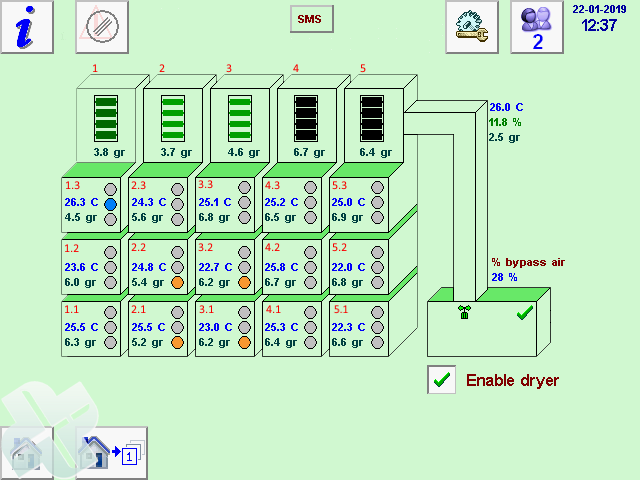 We can also build the software to optimize and automate your existing drying installation. For new and existing installations, the goal is to automatically achieve the desired moisture content. 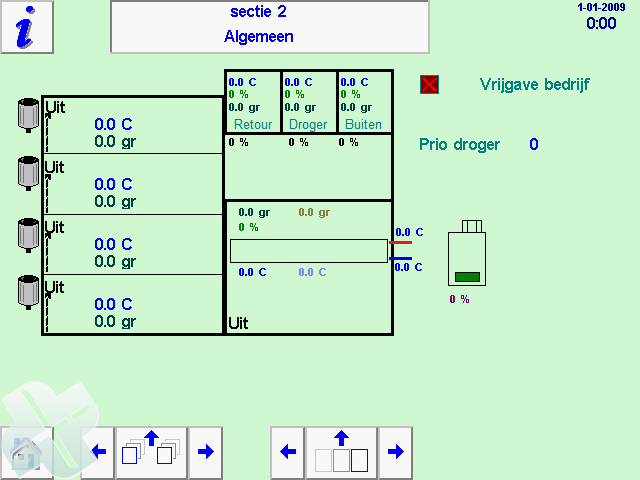 The ABC-processor gives detailed visual information about real-time measurements and actual settings. Colors are used to clarify this. 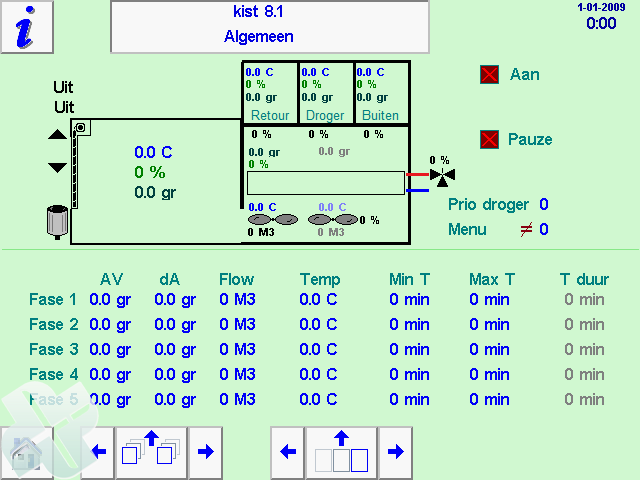 Here is an example of an information window used for adsorption air dryer with heat exchange-unit. Depending on the priority and desired moisture content, the valve settings are calculated per section. 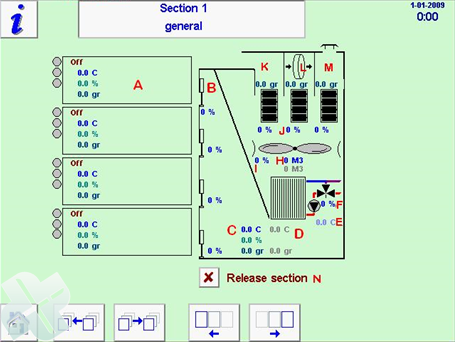 Here is a hydraulic flow diagram of the ABC-control for a drying installation with a heat pump. With this regulation the excess hot water is distributed over different places where some extra (free) heat can be used.